We released the first photos of the US4CES™ Version D (Delta) family of camouflage patterns at SHOT Show last week. This was the secondary submission by ADS Inc. partnered with camo designer Guy Cramer for the US Army Camouflage Improvement effort. 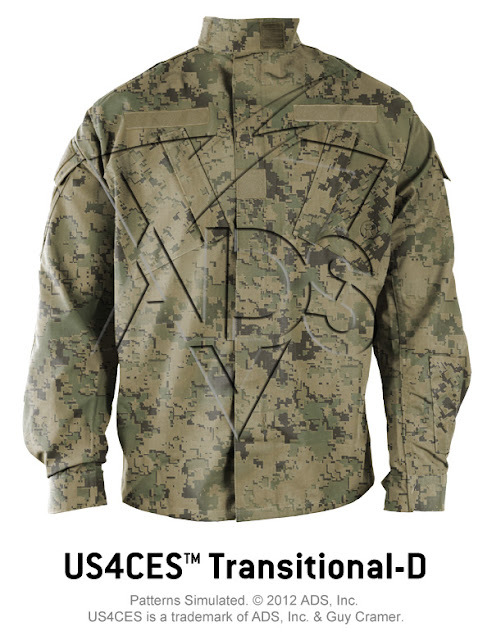 We noted that those patterns were rejected for further evaluation, however their US4CES Version A (Alpha) version was accepted as a finalist based on preliminary testing against base line camouflage patterns. 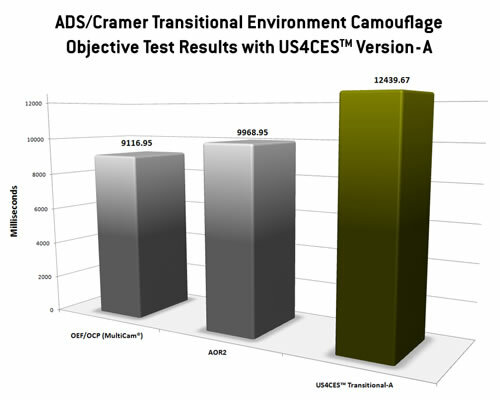 The diagram above shows to which extent the finalist US4CES-A Transitional pattern's testing results exceeded MultiCam (aka OCP) in their own laboratory testing, as well as the AOR2 camouflage just recently released for use by the U.S. Navy. This objective testing based on previous military procedures took was administered by ADS, Inc.'s own laboratories prior to submission of the patterns. In their own testing the US4CES-A Transitional camouflage took more than 25% longer to detect than MultiCam. Being a finalist for further evaluation is certainly a success for ADS Inc. and their collaborating designer, but they certainly are not out of the woods yet. What is not known is how their patterns faired in comparison to other competitors in the US Army's subjective testing. The testing yet to have taken place will provide the true results as to which pattern may be considered for use by the U.S. Army, resulting in final licensing. It is of great interest that ADS Inc. reported the US4CES Version D Arid variant matched or surpassed the baseline U.S. Military patterns. We provided the pattern selection photos above. Clearly with this family of patterns not making it through to the next level of evaluations, the other competing pattern must have exceeded the baselines to some extent. Crye Precision still remains with their family of patterns, so deduction permits that they must have surpassed their own MultiCam pattern with their own submission. Given these preliminary results, one could presume that the U.S. Army will utilize one or more of the finalist camouflage patterns for future military uniforms, gear, and equipment, or this would simply be all for naught and a big waste. However, the next evaluation process may prove some faults in initial test procedure, but we would speculate that i's were dotted and t's were crossed to make sure for a smooth process. ADS, Inc. is proud to announce on their company site that the US4CES Delta is now free for licensing. As we have noted in the past, we expect the Alpha version of US4CES, not yet released to be fairly comparable in pattern to the Delta version. However, great surprises have come from such processes. If our assumption is correct in the two families being comparable, it will be an ever evolving story in regards to how all of the patterns involved will progress within the commercial and military market in the event any of the US4CES Alpha camouflage variants are utilized by the US Army in the future. We congratulate ADS Inc. and Guy Cramer on their success thus far in the effort and can't wait to see what the other competitors have up their sleeves. To start with, I'd prefer it if gee-whizzy 3D graphs were not used to present 2D data. I am curious to see the images in which the patterns were tested, as there is the potential for bias, and the sample size, which may be statistically insignificant. It should be noted that Multicam is deliberately designed to 'take on' ambient light to modify its pale colour, and this would be hard to simulate in laboratory tests.